Big fat disclaimer: this article is provided for translation purposes only and does NOT constitute official tax advice. Please see our list of English-speaking tax advisers at the bottom of this article for professionals who can advise you on your own personal situation. This article is based on the most recent form, version 2016FsEEU from June 2016. Please note that the form is subject to change slightly over time. To start invoicing and collecting money in Germany, you’ll need to get a freelance Steuernummer or tax number (not the same thing as the tax ID you received after registering your address) — and that means filling out the Fragebogen zur steuerlichen Erfassung. It looks pretty intimidating at first glance, but for most freelancers a lot of the lines can stay blank. In general, anything that doesn’t apply to you, leave blank. And of course, if you have any questions or doubts at all, please double-check with a tax professional! 1. An das Finanzamt — to the Finanzamt. Put the name of your neighborhood here. This is also the office where the completed Fragebogen should be returned, in person or via post. 2. Steuernummer — tax number. You can leave this blank if you do not yet have one. 3. Aufnahme einer gewerblichen, selbständigen (freiberuflichen) oder land- und forstwirstchaftlichen Tätigkeit —Setting up a commercial, self-employed (freelance), agricultural or forestry occupation. Check this box if you starting to work as a freelancer or Gewerbe (tradesperson). If you are unsure what those two terms mean, check out Expath’s online workshop ‘Freelancing in Germany’ for more information. Typical freelance jobs include artists, language trainers, translators/interpreters, etc. 4. Beteilungen an einer Personengesellschaft/-gemeinschaft — only if you are in a formal business partnership. Freelancers usually leave this blank. 5. Name, Vorname —last and first names. 6. ggf. Geburtsname — birth name if applicable. This is your maiden name (before marriage) or if you had another name at birth for whatever reason. You can also add any titles such as Dr. here. 7. Ausgeübter Beruf, Geburtsdatum — current profession, birthdate. 8. Straße — street. Just the street name. 10. Postleitzahl, Wohnort — postal code, city. 11. Postleitzahl, Ort (Postfach), Postfach — postal box number, city. 12. Identifikationsnummer, Religion — Tax ID Number, religion. The Tax ID Number should have arrived shortly after you registered your address (Anmeldung) on an official looking piece of paper. For religion you can select RF (Protestant), AK (Roman Catholic) or VD (other). 13. Stand der Ehe/eingetragenen Lebenspartnerschaft — status of marriage or official civil partnership. Write the date (day, month, year) for one of four choices: Verheiratet/Eingetragen seit dem — married/in civil union since; Verwitwet seit dem — widowed since; Geschieden/Aufgehoben seit dem — divorced since; Dauernd getrennt lebend seit dem — separated since. Section 1.2 is about your spouse — if no spouse skip to item 21. 14–20. Repeat the personal information from lines 5–12 about your spouse. If you share the same address you don’t need to enter it again. 21–22. Telefon: Vorwahl international, Vorwahl national, Rufnummer. phone number(s), international code, country code, phone number. If you have a German mobile number just fill out Rufnummer, i.e. 0176 123 456 78. 25–26. Art der Tätigkeit (genaue Bezeichnung des Gewerbezweiges) — type of work (exact description of business). It’s important to describe exactly what you do. Please keep in mind that what you write here may determine if the Finanamt sees you as a freelancer or Gewerbe (tradesperson) — starting a Gewerbe requires additional steps, so if you are in doubt research this carefully. It is also fine to write two things here. Be as specific as you can be, for example: Freiberufliche Künstler und Grafiker — freelance artist and graphic designer. Section 1.5 is about your bank details. Freelancers using just one bank account complete lines 27–30. If you have separate personal and business accounts, complete lines 31–34 for your personal account and lines 35–38 for your business account. 29. Geldinstitut (Name, Ort) — bank (Name, city). 30. Kontoinhaber — account owner. If the bank account is under your name check the first box, lt. Zeile 5 — same as line 5. If the bank account is under your partner’s name check the second box, lt. Zeile 14 — same as line 14. If it is under a different name write that in the last box where it says ggf. abweichende(r) Kontoinhaber(in). 31–34. Same as lines 27–30 for your personal account, if you have separate personal and business accounts. 35–38. Same as lines 27–30 for your business account, if you have separate personal and business accounts. 39. SEPA-Lastschriftverfahren — SEPA Direct Debit permission. Do you want to have your taxes debited directly from your bank account by the Finanzamt? This ensures any payments are done on time, avoiding possible penalties for late payments. If you check yes, you must complete a separate SEPA-Lastschriftmandat form. 40. Steuerliche Beratung — tax advisor. Check Nein or Ja — if you do not yet have a tax advisor skip to line 49. 41. Firma — company. Complete if a company does your taxes. 42. Name, Vorname — last and first name. Complete if an individual person does your taxes. 44. Hausnummer, Hausnummerzusatz, Adressergänzung — house number, any additional information. 45. Postleitzahl, Ort — postal code, city. 46. Postleitzahl, Ort (Postfach), Postfach — postal box number, city. 47. Telefon: Vorwahl international, Vorwahl national, Rufnummer —phone number(s), international code, country code, phone number. If you have a German mobile number just fill out Rufnummer, i.e. 0176 123 456 78. 49. 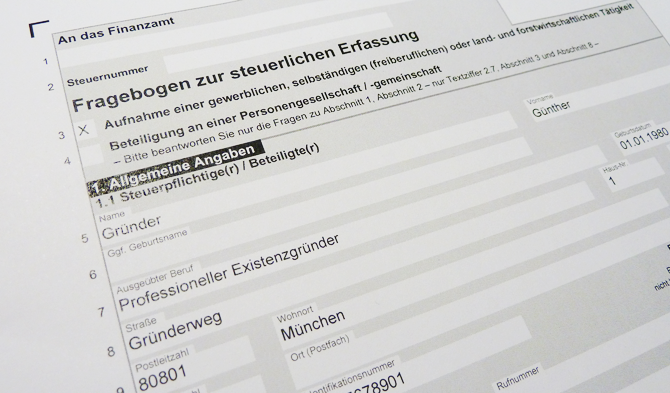 Empfangsbevollmächtige(r) — power of attorney for tax purposes. If your tax adviser from section 1.6 also has power of attorney to handle any tax-related correspondence for you, check this box. If nobody has power of attorney for you skip to line 59. 50–57. If another person has power of attorney for tax purposes (like a lawyer) put her/his information here. 58. Die gesonderte Vollmacht für Zeile 52 or 53 ist beigefügt — the power of attorney form is attached (for the person mentioned in lines 50–57). 59. Bisherige persönliche Verhältnisse Falls sie innerhalb der letzten 12 Monate zugezogen sind — previous address in case you moved to Berlin in the last 12 months. In line 59 write your move date. 61. Hausnummer, Hausnummerzusatz, Adressergänzung — house number, any additional information. 62. Postleitzahl, Wohnort — postal code, city. If you moved from abroad also add your country after the city. 63. Postleitzahl, Ort (Postfach), Postfach — postal box number, city. 64–65. Waren Sie in den letzten drei Jahren für Zwecke der Einkommensteuer steuerlich erfasst? Were you (or your spouse or civil partner) audited for tax purposes in the last 3 years? (by the German authorities) Check Nein or Ja. If yes, add the name of the Finanzamt that audited you (i.e. Finanzamt Friedrichshain-Kreuzberg) and your Steuernummer or freelance tax number. Section 2.1. Anschrift des Unternehmens — official address & contact information of your company. If you work from home, leave lines 67–76 blank. 66. Bezeichnung — company name. If you are a freelancer your official company name must always include your own name, plus possibly a job title or ‘fantasy name’ (brand name). For example, Maria Smith, freiberufliche Künstlerin (Maria Smith, freelance artist) or Berliner Graphics, Inhaber Andre Colbert (Berliner Graphics, owner Andre Colbert). 67–76. You only need to complete if you have a different official company address, phone number, email or website from what you entered in lines 8–24. 77. Beginn der Tätigkeit (inclusive Vorbereitungshandlungen) — beginning of occupation (including preparations). Put the date you started any official tasks related to your business (opening a business bank account, renting an office space, signing contracts, etc.). This date can also be before you officially do the Fragebogen. 78. Betriebstätten. Werden in mehreren Gemeinden Betriebstätten unterhalten? Will you have offices in more than one neighborhood? If not, check Nein and skip to line 90. 79–89. Information of additional branches of your office. 90–92. Handelsregistereintragung — entry in Commercial Registry. If you are not registered in the Commercial Registry (freelancers are not required to do this) check Nein and skip to line 95. 95–96. Gründungsform — business form. You generally check the box before Neugrundung zum (founding a new business) and enter the date you started your business (as in line 77) and skip to line 104. The other options are Übernahme (taking over an existing business), Verlegung (transfer) or Umwandlung/Einbringung/Verschmelzung (merger/changing business form). 97–103. If you’ve bought, inherited, merged into an existing company the name and information goes here (and talk to a tax advisor!). 104–108. Bisherige betriebliche Verhältnisse — previous business circumstances. This question asks if you’ve already been doing a Gewerbe (trade), self-employed (freelance), agriculture or forestry job, if you’ve been part of a formal business partnership, or if you’ve owned more than 1% of a corporation — in the last 5 years in Germany. Check Nein and skip to line 109, or check Ja and complete the information about your other work. Section 3. Angaben zur Festsetzung der Vorauszahlungen (Einkommensteuer, Gewerbesteuer) — information for determining tax prepayments. Your prediction of your profits for this year (im Jahr der Betriebseröffnung, or the year of your business opening) and next (im Folgejahr) is the basis for the quarterly income (or trade tax) prepayments the Finanzamt assesses you. There are four columns for rows 109–115, for your earnings (Steuerpflichtige(r)) and your spouse or civil partner’s (Ehegatte(in)/Lebenspartner(in) for this year and next year. Please note that you should state in the columns your projected PROFIT (income minus expenses) for the year. Section 3.2. is for projected special expenses and estimated income tax payments. If you are unsure, you can also leave lines 116 and 117 blank. 116. Sonderausgaben — Special expenses. This does not refer to regular business expenses like office supplies but rather to things like pension savings, which are a special tax write-off. 117 . Steuerabzugsbeträge — Tax deductions. Estimate your income tax payments here, or if unsure leave blank. Section 4. Angaben zur Gewinnermittlung — Information about financial reporting. This section asks how your earnings will be reported (which type of accounting you will use). 118. Gewinnermittlungsart — Einnahmenüberschussrechnung — Financial reporting — net income method, also known as single-entry bookkeeping. This is usually the simplest method which most freelancers use. You track your income and expenses monthly and pay income taxes based on your profit. Learn more about single- and double-entry bookkeeping (see next point) here and here. 119. Vermögensvergleich (Bilanz) — balance sheet bookkeeping or double-entry bookkeeping is required for some types of Gewerbe (for example, when registered in the Handelsregister, or earning over 600,000€ in income or 60,000€ profit). If you are a Gewerbe and unsure which type of bookkeeping you have to do, please double-check with a tax adviser. 120. Gewinnermittlung nach Durchschnittssätzen — profit reporting based on average rates — will usually not apply to freelancers. 121. Sonstige — other — will usually not apply to freelancers. 122. Liegt ein vom Kalenderjahr abweichendes Wirtschaftsjahr vor? — Does your business year differ from the calendar year? The business year for freelancers is almost always the same as the calendar year, meaning Jan.-Dec. so you’ll probably check Nein. 123. Freistellungsbescheinigung gem. §48b Einkommensteuergesetz — exemption certificate for construction work. This may apply if you have significant expenses related to installing or building your business facilities. If so please check with a tax advisor. Section 6 is about Lohnsteuer or payroll tax. We will assume you have no employees so skip to line 131. Section 7. Angaben zur Anmeldung und Abführung der Umsatzsteuer — Information for registration and deduction of VAT. This section is about Umsatzsteuer or VAT. Please note that even if you do not earn enough to have to charge VAT you still need to complete sections 7.1, 7.2 and 7.3. If you will, or think you need to, collect VAT then we highly recommend talking to a tax adviser. 131. Summe der Umsätze (geschätzt) — Amount of turnover (estimated). This line asks for your estimated total earnings (not including deductions) in your first year of freelancing (im Jahr der Betriebseröffnung) and for the following year (im Folgejahr). For your first year of freelancing, estimate the income from your start date to the end of the calendar year, so for example March 15, 2017-Dec. 31, 2017. For the second year, you will use the entire calendar year of 2018. 132. Geschäftsveräußerung im Ganzen (§ 1 Abs. 1a UStG)— Transfer of entire business. If you did not buy an entire business, check Nein. 7.3 Kleinunternehmer Reglung — Small business owner regulation. Small business owners (those earning less than 17,500€ per year of freelance or self-employed income, not factoring in deductions and expenses) are considered Kleinunternehmer, or small business owners, and are not required to charge VAT (Umsatzsteuer, also often called Mehrwertsteuer). 133. If you estimate that you will earn less than 17,500€ and will not charge VAT as a small business owner, check this box and skip directly to line 160. 134. If you estimate that you will earn less than 17,500€ but plan to charge VAT anyhow, check this box. In some situations it may benefit freelancers earning under 17,500€ to collect VAT voluntarily, like if they have lots of business expenses they are paying VAT on which can be offset against VAT collected. Please note that this commits you to doing VAT for at least 5 calendar years, and that you are required to submit monthly or quarterly VAT statements online to the Finanzamt. Section 7.4. Organschaft — Tax group. This refers to intercompany grouping for tax purposes and will not apply to individual freelancers so skip to line 145. 145. Steuerbefreiung — Tax exemption according to §4 of the Umsatzsteuergesetz (VAT law). This only applies to select industries (shipping and freight services, insurance brokers, doctors and hospitals, schools and universities, delivering human organs, etc.) so most freelancers will leave this blank. When in doubt, ask a tax adviser! 146. Steuersatz — Reduced tax rate according to §12, Paragraph 2 of the Umsatzsteuergesetz. A few special classes of items (artwork, musical or theater performances, books & magazines, cattle farming, artificial insemination of animals, etc.) have a reduced VAT rate of 7% (versus the standard 19%). If you will collect VAT but plan to sell work in this category, check this box. 147. Durchschnittssatzbesteuerung — Average taxation rate according to §24 of the Umsatzsteuergesetz. This only applies to forestry so leave blank. 7.8 Soll-/Istversteurung der Entgelte — Target or actual tax payments. If you will charge VAT, you must decide if you will report and pay VAT based on what you should have collected from customers as reported on your invoices (SOLL) or what you have actually collected to-date (IST). 148. Sollversteuerung. If you will report and pay VAT based on your incoming and outgoing invoices (regardless of whether all your customers have paid), check this box and skip to line 153. 149. Istversteuerung. If you will report and pay VAT based on what you have actually collected from customers, check this box and also fill out a reason why in lines 150–152. Number 150 or 152 are the most likely choices for freelancers. 150. Der auf das Kalendarjahr hochgerechnete Gesamtumsatz für das Gründungsjahr voraussichtlich nicht mehr als 500,000€ betragen wird. The total revenue in the year of opening my business will not be over 500,000€. 151. ich von der Verpflichtung, Bücher zu führen und auf Grund jährlicher Bestandsaufnahmen regelmäßig Abschlüsse zu machen, nach §148 AO befreit bin. I am not obliged to do double-bookkeeping based on §148 AO. 152. ich Umsätze ausführe, für die ich als Angehöriger eines freien Berufs im Sinne von §18 Abs. 1 Nr. 1 des Einkommensteuergesetzes weder buchführungspflichtig bin noch freiwillig Bücher führe. I am a freelancer and do not have to do double-bookkeeping, nor do I choose to do it voluntarily. 7.9 Umsatzsteuer-Identifikationsnummer — VAT Tax ID Number. 153. Ich benötige für die Teilnahme am innergemeinschaftlichten Waren- und Dienstleistungsverkehr eine Umsatzsteuer-Identifikationsnummer — I need a VAT Tax ID Number for doing business within the EU member states. 154. Ich habe bereits für eine frühere Tätigkeit folgende USt-IdNr. erhalten — I already have a VAT Tax ID Number from earlier work. 155. USt-IdNr. — VAT Tax ID Number. Vergabedatum — Issue date. 7.10 Steuerschuldnerschaft des Leistungsempfängers bei Bau- und/oder Gebäudereinigungsleistungen — Special tax liability for construction and cleaning services. This will not apply to freelancers. 7.11 Besonderes Besteuerungsverfahren ‘Mini-one-stop-shop’ — Special VAT processes for ‘Mini-one-stop-shop.’ This applies to telecommunication, radio or television services, or other electronically provided services (webhosting or downloadable products like software, music, e-books or webinars, etc.) you supply to a private customer based in another EU country (so, B2C). You can read more about what may fall into this category here. Please note that this rule operates independently from whether or not you are a Kleinunternehmer earning less than 17,500€. That means it could apply to you even if you sell one e-book for just a few Euros to a customer in France. If you think this may apply to you, we highly recommend talking to a tax adviser! Section 8. Angaben zur Beteiligung an einer Personengesellschaft/-gemeinschaft — Information about shares in a business partnership. Only applies if you have a formal business partnership, if you are an individual freelancer/self-employed worker leave blank. 166. Ort, Datum, Unterschrift — Place, date, signature(s). If you are finished with the form, print it out, add the city, date and sign the form. If you have a spouse or legal partner have them sign as well. 167–173. Check if you have any attachments such as a power of attorney form, business partnership form, etc. Otherwise leave this last page blank for the Finanzamt. The Final Step: print this form, sign and date it, and mail or bring it in person to the Finanzamt of your neighborhood. Still need help? One of the most common questions we’re asked at Expath is for an English-speaking tax adviser. We’ve compiled a list of those we’ve heard good things about from our other customers — please note that tax advisers in Germany are often busy and not always accepting new clients, so you may need to be persistent in contacting people until you find one! Tax advisers can be expensive (but worth it!). It’s always a good idea to politely check up front how much and when the tax adviser or accountant will charge you, so you don’t get any surprise bills (although they are also a business write-off). Good luck — and if you love your tax adviser and want to recommend her or him feel free to share in the comments or let us know at Expath and we’ll pass that on to our customers!